Players who love pets will love this slot game from Playtech. Cute is the kitten and Fluffy is the puppy. 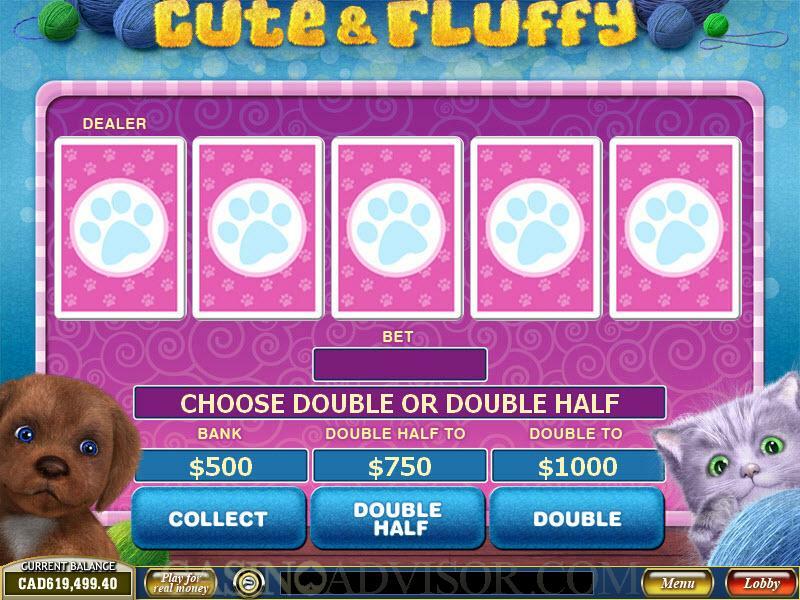 The slot game begins with a large image of Cute and Fluffy ensconced on a sofa before displaying the reels. The symbols on the reels are perfect for this theme. Cute is the scatter symbol and Fluffy is the wild symbol. Fluffy’s Bone is the bonus symbol. The other thematic symbols are Fluffy’s Food Bag, Cute’s Basket and Ball of Wool and Cute and Fluffy’s Food Bowl . High value card symbols from A to 9 are also there on the reels. All symbols are in bright colors. 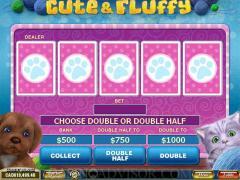 Cute & Fluffy is a 25 payline video slot. It makes sense to wager with all paylines enabled because winning combination's pay only if they appear on enabled paylines. The player can wager up to 10 coins per payline. The number of coins is adjusted by increasing or decreasing the line bet, which directly displays the product of the number of coins and the coin size. There are eight possible coin sizes ranging from 0.01 to 5.00. Six of these are 1.00 or less giving greater flexibility to low rollers. Cute is the scatter symbol. 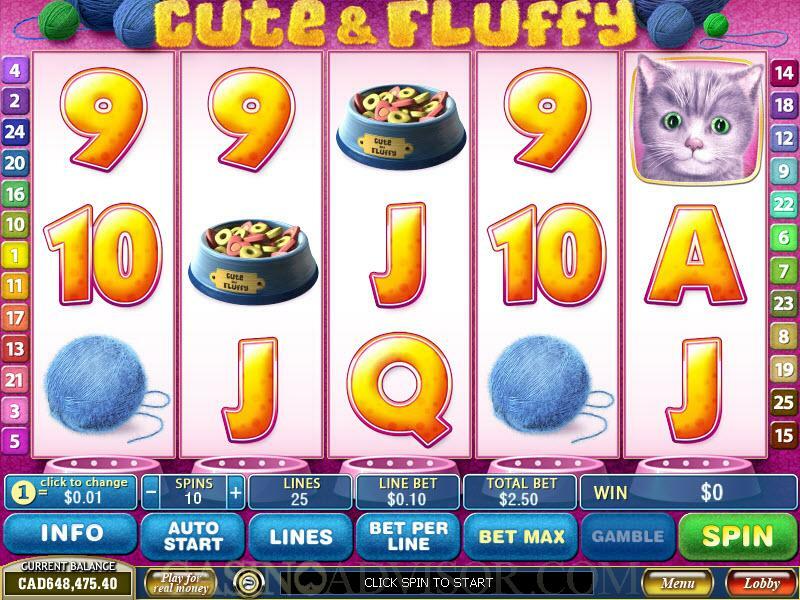 It offers scatter payouts when three or more Cute symbols appear anywhere on the reels. Fluffy is the wild symbol. It substitutes for all symbols except the scatter symbol. It can appear stacked on the reels in stacks of two or even three, which results in more payouts. Five Fluffy symbols in an enabled payline lead to a fixed jackpot payout of 10,000 coins. The bonus feature is called Collective Bonus and is triggered in a most innovative manner. Watching the bonus game getting triggered is as exciting as the bonus game itself. When the bonus Bone symbol appears on a reel it drops a bone on the plate below the reel. When four bones are collected in any plate the Collective Bonus round is triggered. It offers the player 4 times the total bet as a bonus and five free spins with a 2 times multiplier. The bones in the plate remain the same even if players exit the game and renter. The Collective Bonus round can be re-triggered. 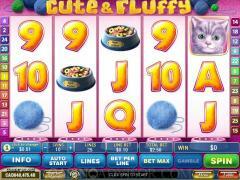 Cute & Fluffy offers a Gamble Game. This game is optional and players can ignore it and collect their winnings. A player wishing to play the gamble game can either stake half his current win or the entire amount of his current win. He has to choose one from four face down cards. If the chosen card is higher than that of the dealer then he wins the gamble game. Interested in reading more detailed information about Cute & Fluffy? If so Click Here for more details.